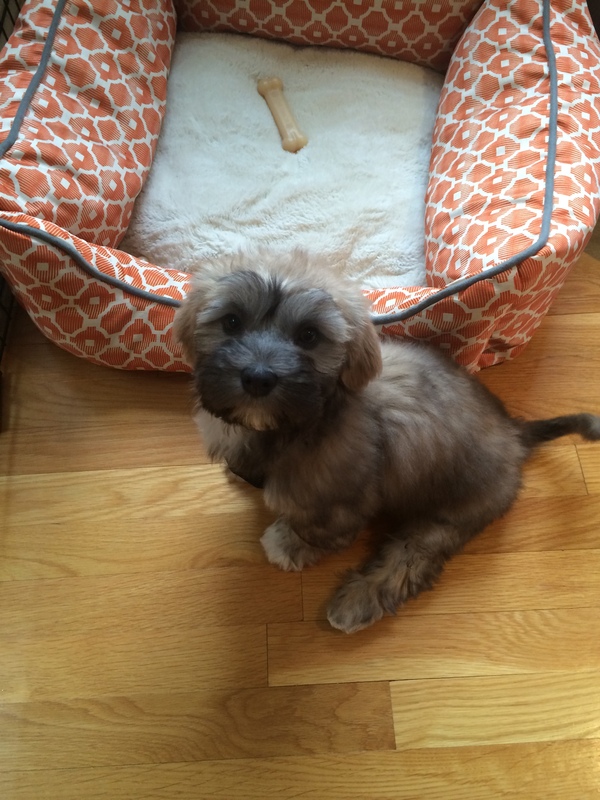 A lot of people warned me that I would experience puppy remorse the first few weeks after Wolfie came home. They cautioned me I might regret adopting a puppy; the mess, the barking, the tiny puddles on the floor. I am happy to report I do not regret having Wolfie, not one little bit. What I do regret is having kids. And a husband. The thing is, with five kids, our household is fairly chaotic. Loud. Add a puppy who resembles a living stuffed animal to the mix? Well, their heads just about exploded from the excitement of it all, and secretly I worried Wolfie’s hair might start to fall out from all the petting. All week my children have raced downstairs at 5:30 in the morning. For what, you so rightly ask? What could be happening in my kitchen at 5:30 am that desperately needed the attention of five kids? Why, a puppy, of course. A puppy who was sleeping in his crate and apparently must be woken. Every single time I sit down to work or start making dinner or attempt to talk on the phone, one of them rushes in to exclaim that the puppy sneezed/snorted/moved/whined/existed. I, on the other hand, want to slow everything down. I want to do exactly what I didn’t do when I had newborns. I want to let the laundry pile up and step over the vacuum and order in take-out so I can have more time to gaze into the puppy’s beautiful brown eyes. I want to squeal about how cu-ute his little nugget poops are and giggle when he nips at my toes. I want to shrug my shoulders and smile tiredly about the sleep deprivation because, really, it’s all worth it. Except it’s not worth it. Because it’s not the puppy who is depriving me of sleep, but the five people I have already sleep-trained and taught to stay in their beds all night and made repeat to me a tired mama is a mean mama as extra motivation. But Wolfie and I? We are simpatico. We love each other. He doesn’t look at me with five-year old belligerence or tween disgust. He doesn’t ask annoying questions about the credit card bill or say the toothpaste is too spicy or beg for waffles when I’ve already made pancakes. I came up with sweet nicknames: Wolfers, Wolf-man, the big W. Pup-pup and Pupperdoodle. I barked—pun intended—at all of them to leave the poor dog alone for five minutes, while at the same time trying to cajole Jack into petting him, holding him, walking him. By Thursday I was an exhausted shell of a person. My eyes felt grainy and my head weighed about a hundred pounds. To break up the afternoon and give the poor animal a chance to rest, I decided we should take a trip to HomeGoods to pick out a new dog bed. Right away, I found the perfect one. It was chic. It was retro. It matched the warm gold walls in our family room perfectly. And even better, it had a soft, fluffy cushion for little Wolf-man to lay his sweet head. Jack, apparently, also thought he found the perfect one. “No. Mom. No. This one. It’s better,” he told me, holding up a tan bed shaped like a dog house. On and on we bickered in the middle of the store, while Henry crawled around pretending, “I Wolfie! I like a puppy!” and Rose tried to put a collar on him. I clutched my bed even closer to my chest and thought, What do you care? You don’t even like him! This isn’t exactly true. There have been baby steps between Jack and Wolfie, autism and puppy. Over the course of the week, Jack had started engaging with Wolfie in his own way: by taking control. He organizes all of the logistics related to his water and food, leash and toy placement. It’s usually the first step in any of Jack’s meaningful relationships, because he likes to be in charge. “But this one is so much better,” I wheedled. “This is good. It’s a DOGHOUSE. He will love it.” Jack insisted. “Fine!” I sneered spitefully. “Let’s buy both and let Wolfie decide!” So out of HomeGoods we trotted, my bed under my arm, Jack’s plush doghouse under his. As soon as we got home he set them up in the puppy’s play area, side by side. Friday morning wasn’t much better. I snapped at all the kids for wanting to hold the leash as we walked down the driveway, and Rose boarded the bus with tears in her eyes. Driving Joey to school, I sighed a long sigh and told him I was sorry, it had been a rough week. I confessed I wasn’t really sure what I was doing. He took a big bite of his egg and cheese wrap, nodded, and agreed. After I kissed him goodbye and dropped him off at school, I thought about steering as opposed to driving; controlling versus keeping in motion. I remembered how I did, in fact, hold him when he was a newborn; how I stepped over the vacuum and called Joe at work to bring home Thai food so I wouldn’t have to cook. How I traced the whorls on the inside of his ears and stroked his thick dark hair. Pulling into Crossfit, I vowed to stop steering; to stop trying to control everything. To let go and lengthen the leash and wander around without a destination. In fact, I decided to let our tiny puppy drive for a little while. I think he’ll take us where we need to go. As for the dog bed Wolfie chose? Well, he circled both beds once, twice, and then hopped into the light tan doghouse, while Jack stood outside of the play area, watching intently. Wolfie and his new bed. 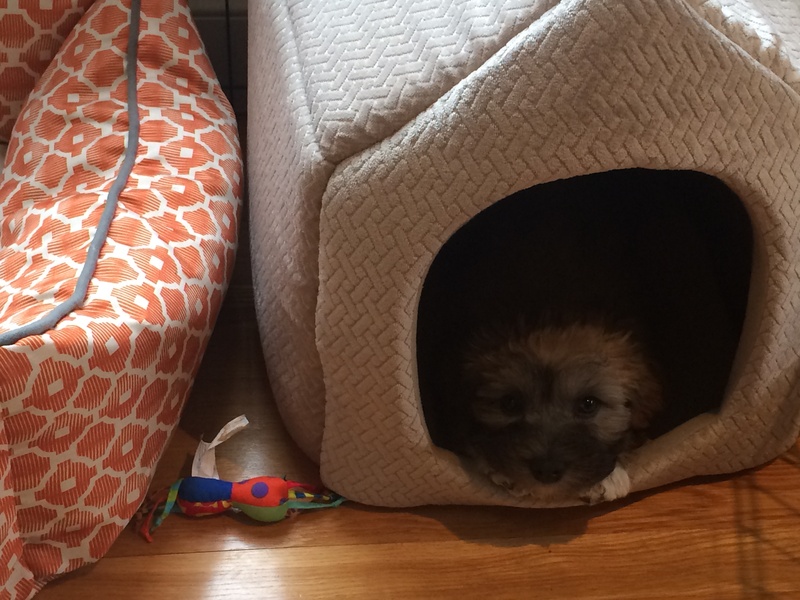 Just standing outside of the chic bed I chose…. the puppy is all hyped up and insane again! and the kids are yelling for you to get him to calm down….oh the joys of puppy-hood….but isn’t it just the best! I get it. I soooo get it. My dog and I–well, I don’t know what I’d do without her. Despite the fact that she is a lot of work. I think I love her more than many humans:). Love this post! I’ve been through the puppy training experience and it brought back so many memories. I love your line, “Joe asked what he could do to get me to love him as much as I do the puppy, and I told him, “Easy. Gaze at me adoringly all day and then go sleep in a crate all night.” You are an excellent writer. Thanks for the good laughs!